30s vintage Sangamo mica capacitors are large enough that they don't mount well on their own leads. Each one must be mechanically supported, either by a solder strip or by screwing to the wooden sides of the chassis. The wooden chassis takes 1 1/2 inches of available length and width. This can impact the layout. Using an all metal chassis there is space for a buffer stage between the oscillator and amplifier. With 1 1/2 taken off the length/width plus the added reinforcing across the middle it would be a challenge to fit the buffer stage in there. Will the lead length be a problem? Certainly I wouldn't trust this spread out layout at 30MHz but it may be OK on 7MHz. Time will tell. 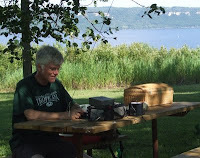 Sunday afternoon, July 5, I got over to Frontenac State Park for some picnic table QRP. The picnic area there sits at the edge of a 400' bluff over looking the Mississippi River. Below the park is Lake Pepin , a naturally wide part of the upper Mississippi. To the east, across the Mississippi/Lake Pepin, is Wisconsin. 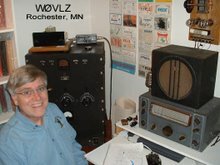 The weather Sunday was sunny but not too warm in the shade, perfect for picnic table QRP.